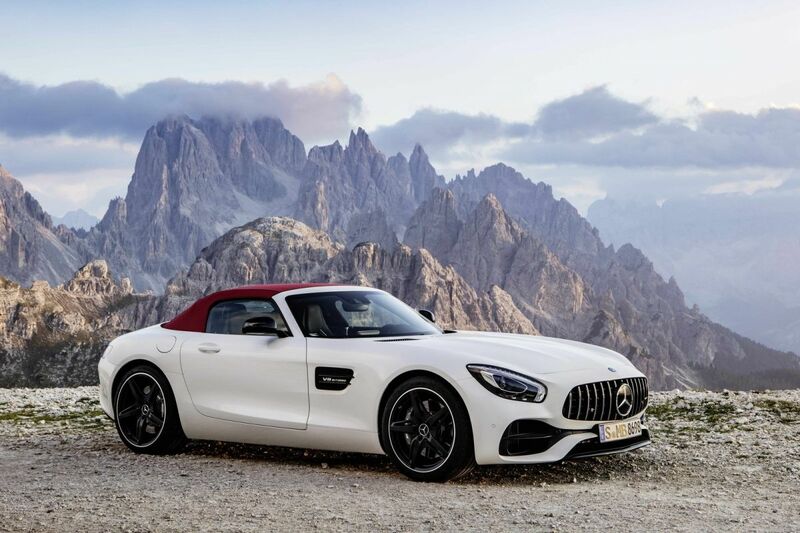 The hotly anticipated Mercedes-AMG GT Roadster is here in all its glory. And not in one, but two guises. The surprise variant is called Mercedes-AMG GT C and it is a new, more potent bridge model between the GT S and GT R, complete with 557 hp and the trick active rear axle steering and electronically controlled rear axle locking differential of the later. 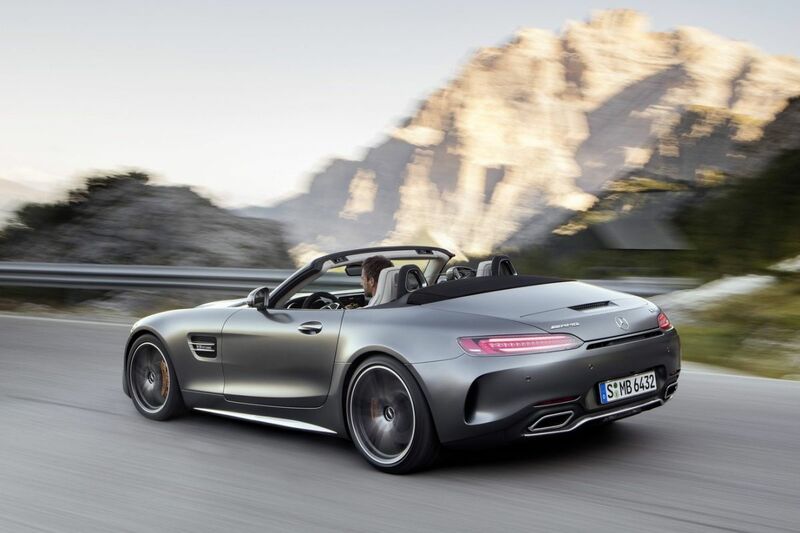 Just like the Mercedes SLS Roadster forebear, the AMG GT Roadster carries an electrically operated fabric top which opens or closes in 11 seconds, up to 50 km/h. It features a triple-layer construction and a low-weight structure consisting of magnesium/steel/aluminium. The canvas top can be ordered in black, red and beige. Unique to the Mercedes-AMG GT Roadster is the new rollover protection: an integrated aluminium cross-member with rollover bars. 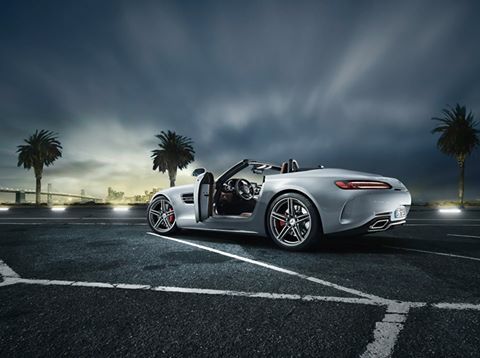 When closed, the soft top mimics the Mercedes-AMG GT coupe shape quite gracefully. Only the rear screen is cut a little steeper with the result of a longer boot lid. To make up for the possible losses in body stiffness implied by the open structure, the bodyshell of the new Mercedes-AMG GT Roadster has been specifically reinforced further to take account of the car’s design as a roadster. Side skirts with greater wall thicknesses and more chambers are used. The dashboard support is braced against the windscreen surround by additional struts, and a strut tower brace between the soft top and the tank reinforces the rear axle. A cross-member behind the seats supports the fixed roll-over protection system. Another new feature is the trunk lid made from new carbon fiber reinforced plastic called SMC (Sheet Moulding Compound), the active air control system at the bottom of the new front apron and the Panamericana grille with 15 chrome-plated, vertical bars. What cannot be missing in an open Mercedes is the famous Airscarf neck warming system, also available for the GT Roadster. In addition, a high-tech Burmester sound system has been adapted for the open two-seater. 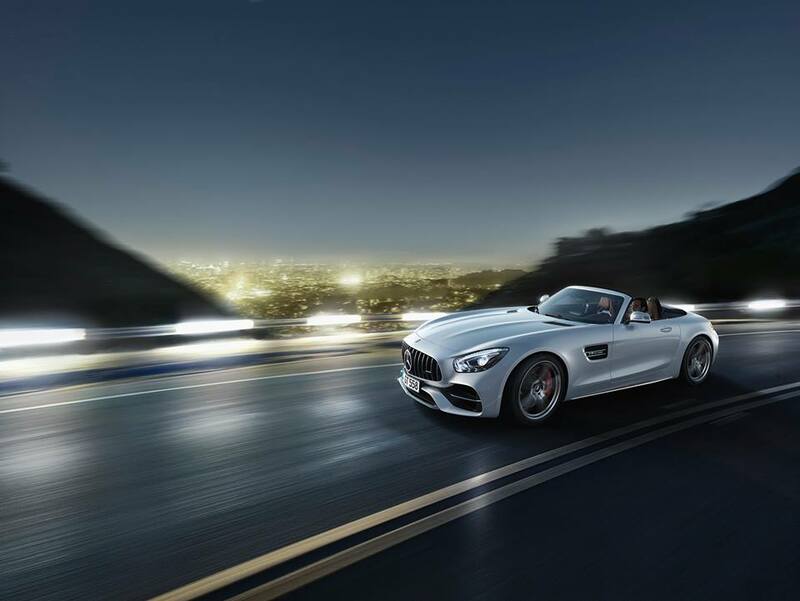 In base form, the Mercedes-AMG GT Roadster is powered by the familiar 476 hp and 630 Nm four-liter twin-turbo V8. This takes the Roadster in 4.0 seconds to 100 km/h and allows cockpit winds of up to 302 km / h. Who loves it even more violently can dial up and go for the GT C variant – which will be also become available for the coupe in 2017. At 410 kW (557 hp), the peak output is 35 kW (47 hp) above that of the AMG GT S and 20 kW (28 hp) below the Mercedes-AMG GT R. The maximum torque of 680 newton metres is available from 1900 to 5750 rpm. A sprint from zero to 100 km/h is absolved in 3.7 seconds, and this fulminating acceleration only ends at the top speed of 316 km/h. In addition to the power supplement, the GT C version uses some of the technical refinements of the AMG GT R. The chassis C gets AMG RIDE CONTROL continuously variable, adaptive damping system and 19 or 20-inch wheels (GT: only 19 inch). The GT C also features active rear axle steering. Up to a speed of 100 km/h, the rear wheels are turned in the opposite direction to the front wheels, the Mercedes-AMG GT C Roadster turns into corners with significantly higher agility as a result. Above 100 km/h, the system turns the rear wheels in the same direction as the front wheels. This noticeably improves handling stability. At the same time, the lateral force on the rear wheels builds up considerably faster when changing direction, which makes the response to steering inputs quicker. 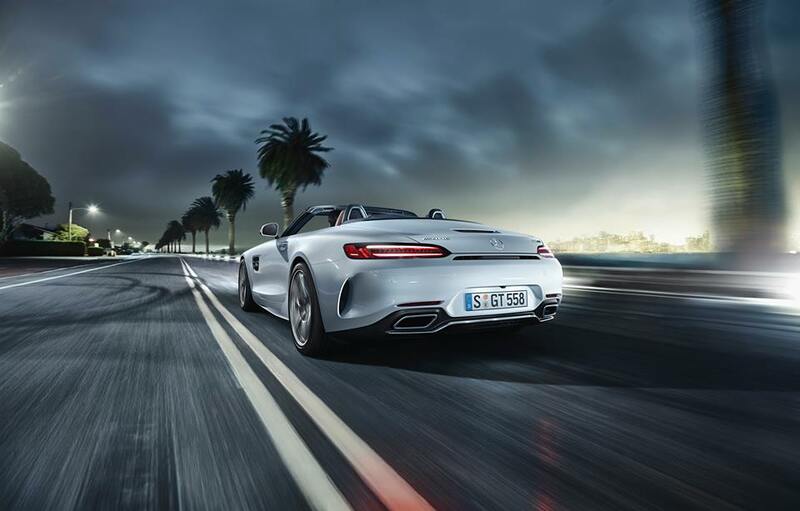 As standard the AMG GT C Roadster is equipped with an electronically controlled locking differential at the rear axle (Mercedes-AMG GT Roadster: mechanical locking differential). Even the look of the Mercedes-AMG GT C Roadster mimics very closely the GT R. New 57 mm wider rear fenders make room for the wider track and wider wheels on the rear axle, all good for higher cornering speeds and improved traction. The seven-speed dual-clutch AMG SPEEDSHIFT DCT 7-speed transmission gets a higher ratio overall, but a lower ratio fitted to the seventh gear. That means better acceleration, but easier cruising. In addition, the AMG GT Roadster C has a lithium-ion battery, Nappa leather, the AMG performance steering wheel, the additional transmission mode RACE and a performance exhaust system with valve control. The transmission mode “RACE” optimally adjusts the shift strategy of the dual clutch transmission to the needs of the racetrack – very fast shift speeds and highly emotive engine sound are included. By pressing the separate “M” button in the centre console, the driver can activate the manual transmission mode in any drive mode. The base Mercedes-AMG GT offers (via AMG DYNAMIC SELECT controller) three transmission modes “C” (Comfort), “S” (Sport), “S+” (Sport Plus) and the individually programmable setup “I” (Individual). The AMG performance exhaust system boasts two variably adjustable flaps which open and close to modulate the sound of the engine depending on the selected AMG DRIVE SELECT mode. In the “Comfort” and “Sport” settings, the low-frequency sound typical of a V8 is designed for comfort. In “Sport Plus” and “RACE” modes the sound composition is far more emotive. 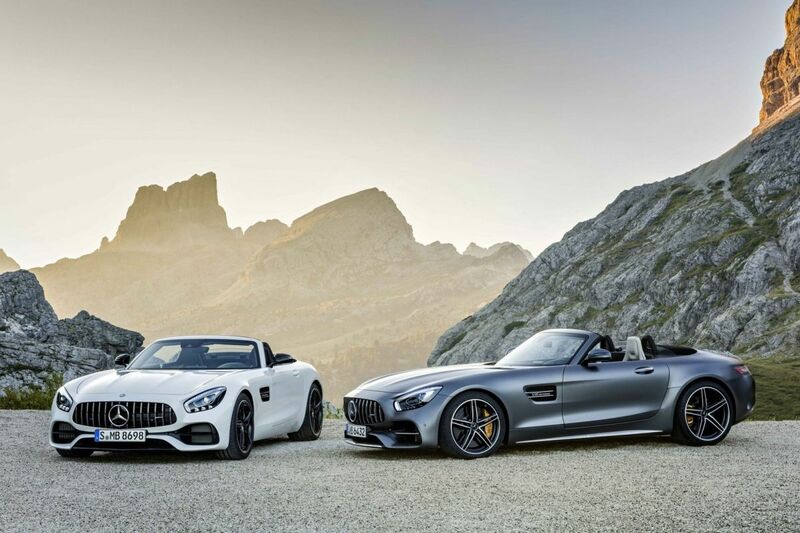 The Mercedes-AMG GT Roadster will come the market in spring 2017. Prices have not been announced yet.